Why should I have a personal color analysis? Every person’s reasons for wanting a personal color analysis are different. Many simply want a wardrobe upgrade – they have a ton of clothes, but nothing to wear or what used to look good on them no longer does. For those who have never felt good about their wardrobe or what they see staring back at them in the mirror, this might be a starting point. I explained my reasons and how the process was life changing for me in this blog post. I’ve already had a personal color analysis, would I benefit from working with you? Absolutely! If you love your colors, we can use your current fan to curate your closet, shop for your best pieces or determine your best style. If you aren’t feeling quite right with your colors, then you could be a hybrid like me and not fit into a specific season. In that case, you would really benefit from a custom fan. In the case of the client below, she fit perfectly into one of the 12 sub-seasons, but wasn’t happy with her original non-custom fan, because she only felt comfortable in half the colors. Since her custom fan is built around how she is uniquely colored and isn’t generic, she is thrilled with all of her colors and feeling more confident! To ensure an accurate analysis, the appointment is conducted in my studio during the day, so that we have great natural light. My studio is located in the Bellevue, Nebraska area although I have perfected the process for virtual analyses as well. You can wear makeup to the appointment, if you’d like, but we will need to remove your foundation or powder. You can choose to bring a few makeup or clothing items to either appointment if you’d like to review them with me and your fan. How is your color analysis different from others? A personal color analysis divides clients into four main seasons – Spring, Summer, Autumn, and Winter and then breaks them into sub-seasons. Most systems have 12 sub-seasons, so 3 variations for each season. Once a sub-season is determined, the client receives a fan for that specific season. My system differs in that we start with 24 sub-seasons (6 variations per season) and then customize even further providing a 100% unique fan to each client. One of the best parts of the system I use, is that the fans are made out of fabric, which makes it much easier to utilize with clothing than other fans. Many people are hybrids – meaning they don’t fit perfectly into one sub-season. Take me, for instance. I have a 100% Spring personality and style, but my coloring leans to Summer. I am basically a slightly cool Spring who needs medium colors. Unfortunately, that does not exist in any of the non-custom systems. Having a custom fan (below) provides me with my very best colors regardless of which season they come from. My fan is a combination of the brightest colors from Summer and the least bright colors from Spring. Another way that my analysis differs is in what I offer my clients. Not only do I provide my clients with their very best colors, but I also provide a 10-page booklet and presentation that explains how to wear their colors. What is the personal color analysis process? We begin the 2-1/2 hour consultation with an assessment of your personality, body shape, your contrast levels, and color quality. Then I determine the color temperature and exact hue of your skin, eyes and hair. Only 35% of the population are all “warm” or all “cool,” which is why simple color tools rarely work well. Based on this overview, I select a base color palette (1 of 24) that comes the closest to matching your personal color harmony. Next, I dismantle the base fan and customize the palette, swatch by swatch, to better match your unique harmony. 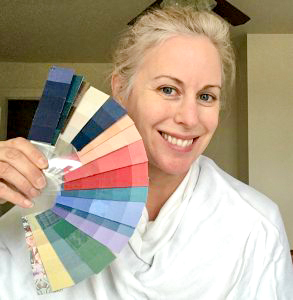 To ensure that each color in your fan is best for you, I will use color swatches from other fans in your season and even from other seasons. Along the way you get to check every choice in a mirror, so you can see for yourself how different colors enhance (or sabotage) your looks. Some of the differences are subtle, but important. Your custom color fan will have 18-20 swatches (with 5 monochromatic colors on each, so almost 100 colors) including your eye related color, your hair related color, your best neutrals, best white, best red/pink, and best accent and dramatic colors including metals, prints, and pastels. 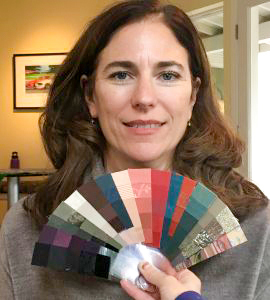 After you approve of the palette, we conclude the appointment with a discussion of how best to use your new color fan as it pertains to your seasonal type. After your appointment, you will receive a detailed 10-page guide describing how best to use your fan and how to build a wardrobe that brings out your very best. About a week after your first appointment, we will have a second appointment where you will receive your fan, we will review how to use it and answer any questions you have. You can choose to forgo an in-person 2nd appointment, if you’d like, and I will send the fan and answer any questions via Skype or email. If you’re curious about the virtual analysis, this document explains the virtual process in detail. What happens after a personal color analysis? I provide continued support via my Facebook page, Pinterest page and blog (sign-up below for my once-per-week newsletter with color and style related information). You can also choose to further refine your style by utilizing my services to help curate your closet or as a shopping companion.